If you can answer “yes” to ALL of the following questions, you are eligible to apply for a grant through the RTCAR initiative. If your answer to any of these questions is “no,” unfortunately we will be unable to consider your project for funding. If your organization is on the Qualla Boundary or other tribal property of the Eastern Band of Cherokee Indians (EBCI), is it a tribal or community service organization? If your organization is not on the Qualla Boundary, will the work you want the RTCAR to help fund directly benefit the people of the EBCI? 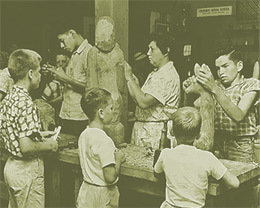 B) Development and preservation of traditional Cherokee arts? Are you already working with and coordinating with other groups that have similar goals, or do you have a concrete plan to begin working with others on the project you want to propose? It is important that regional entities seeking RTCAR assistance work in full partnership with the EBCI. Does your organization have 501(c)(3) nonprofit tax exempt status, or is it a school, institute of higher learning, or government unit (federal, state, local, or tribal)? Debt retirement or operational deficits. Efforts to influence elections or legislation. General funding of projects of governmental units. Promotion of a religious viewpoint.